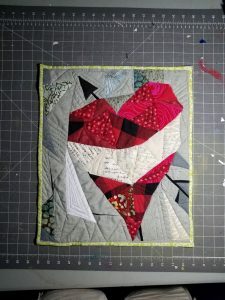 I`m in eagle river,wisconsin and the piece is about 15″ x 17” and i just thought of a valentine and started piecing triangles together. After awhile it became more difficult so different piecings were appliqued until i got an approximate square. I was using invisible thread until the bobbin was actually sheared off by a thread knot i didnt know was happening!